To make things even busier, my precious little baby is currently in the frank breech position, which means that I have to spend my days doing still-somewhat-doable variations of the handstand in order to convince him or her to flip head-down. It had better work! 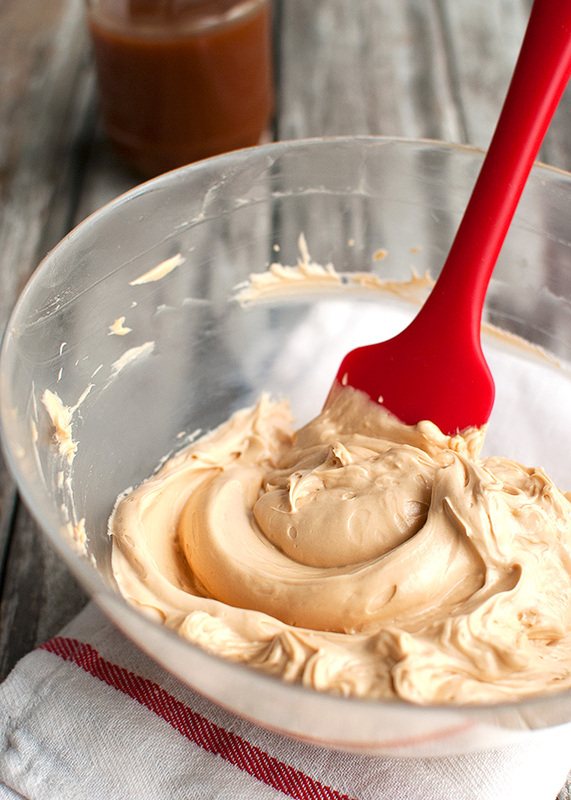 Anyway, you’re probably here for buttercream, so let’s talk a bit more about that. In my post on vanilla German buttercream I already told you guys about this delicious caramel version. 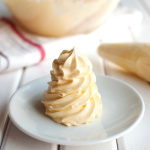 I really wanted to do a caramel version of this buttercream, because this recipe illustrate just how easy it is to flavor German buttercream. You see, all you need to do is to flavor the milk by infusing it with your favorite flavorsome ingredient. I think I mentioned fresh herbs, spices, dried fruits, tea, and toasted nuts in my vanilla German buttercream post, but you can also infuse the milk with caramel! So. First things first. In order to infuse the milk with caramel, you need caramel. I made some from scratch. 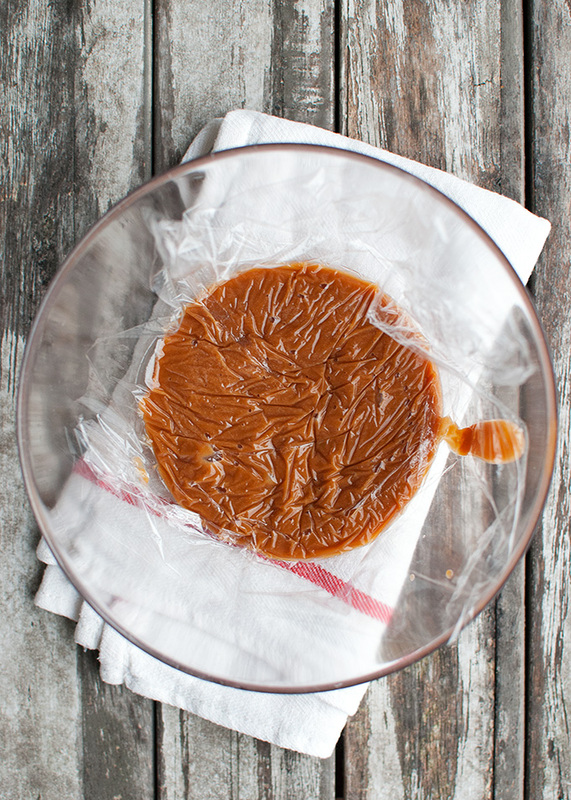 You can also use store-bought caramel, but making caramel is so easy and going to the store to tiresome that I always make my own caramel whenever I need it. Besides, you only need sugar, water and a splash of cream. Ingredients I usually have on hand (although I have to admit that, if I didn’t have a food blog, I probably wouldn’t have fresh cream in my fridge all the time). 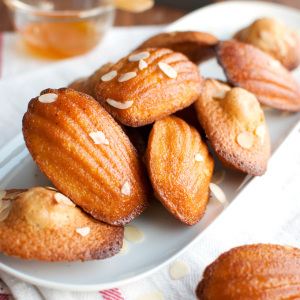 The caramel is really easy to make, but you need to keep your head in the game. Just combine sugar and water in a medium-sized, light colored saucepan, stir the mixture over medium heat until the sugar has dissolved, then crank up the heat and allow the syrup to turn into a golden caramel. 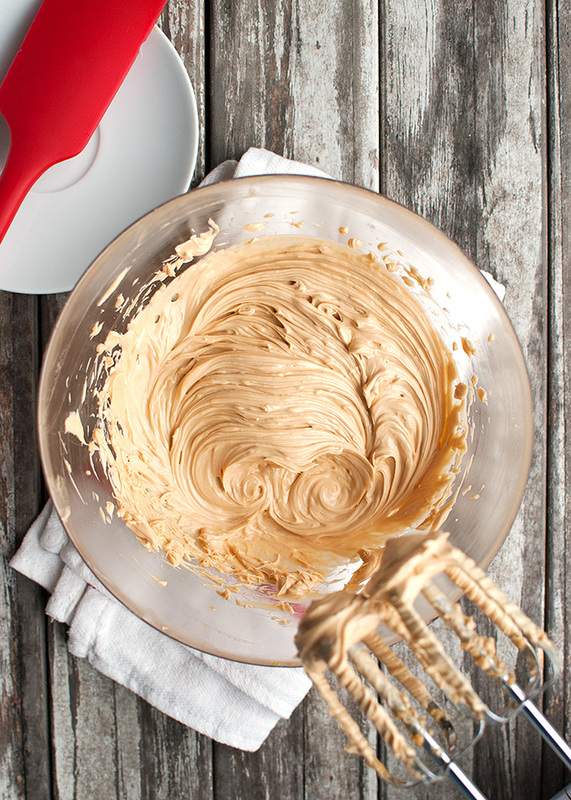 Once you’re happy with the color, you carefully drizzle in the cream, whisking continuously, after which you dunk the bottom of the pan in a few inches of cold water to stop the cooking process. Once you’ve made the caramel, use it to make caramel custard. Yes. That’s right. 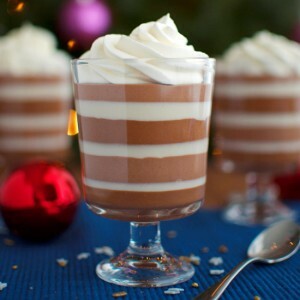 Caramel custard. And yes, it’s super delicious! Anyway, to make it, you simply replace the sugar from the original recipe for German buttercream with the caramel. In other words, combine it with the milk in a saucepan and heat until the caramel has dissolved into the milk. 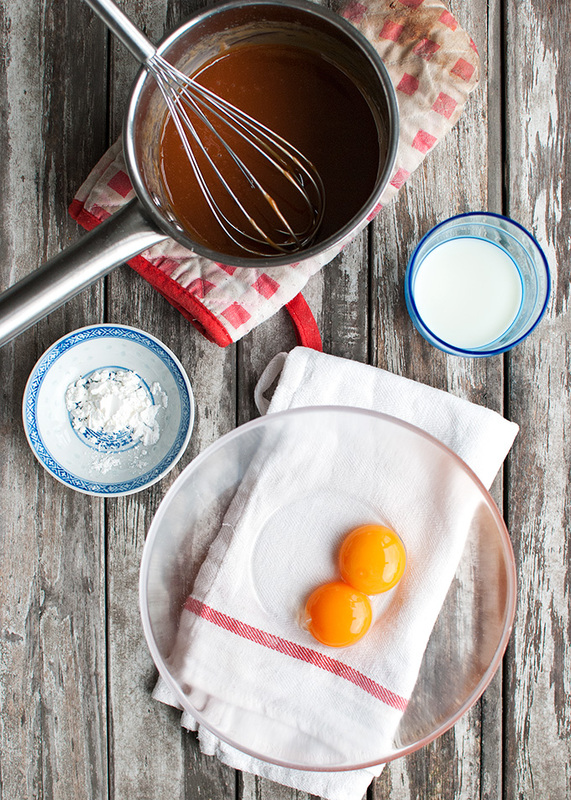 Then scald the milk while you whisk together egg yolks, cornstarch and a few tablespoons of milk. Once the milk mixture starts to boil, carefully drizzle it into the yolk mixture, whisking constantly to prevent the eggs from scrambling. Pour the mixture back into the saucepan and heat over low heat, whisking constantly, until the custard thickens. Transfer the custard to a clean, heatproof bowl and cover with plastic wrap. Oh, and if you want to, you can stop here. The custard is delicious as it is! But for those of you who want to turn it into buttercream, allow the delicious caramel custard to cool to room temperature. Or hey, make it the night before you need the buttercream, so it can chill in the fridge overnight. Once the custard has cooled, beat it into beaten butter one tablespoon at a time, until the buttercream looks thick, smooth and super creamy. 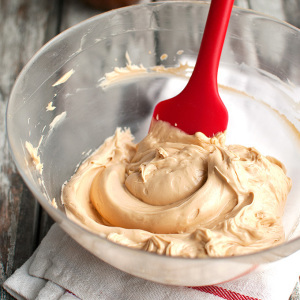 By the way, this caramel version of German buttercream is a bit softer than the vanilla version. It still pipes beautifully, though. However, if it’s a bit too soft for you to work with, just pop the bowl of buttercream in the fridge for about 10-20 minutes to allow the buttercream to firm up a bit. I didn’t have to do this, but I can imagine that when you’re making this buttercream in a warm kitchen it might make a huge difference when it comes to piping! 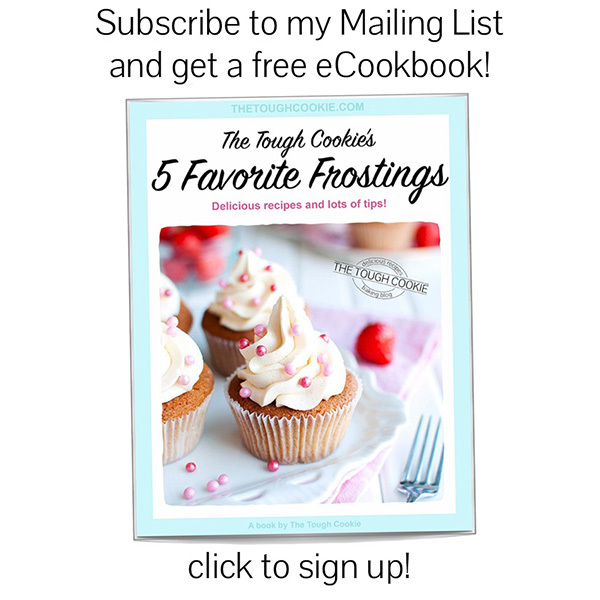 Click here to sign up to my mailing list. Makes about 280g, or about 1½ cups. Enough to generously frost 6-8 cupcakes. Making caramel German buttercream won't take long, but bear in mind that the custard needs time to cool. Fill your kitchen sink with about 5-cm/2-inches of cold water. Once the caramel is done, you need to dunk the bottom of the pan in this cold water bath to stop the cooking process. 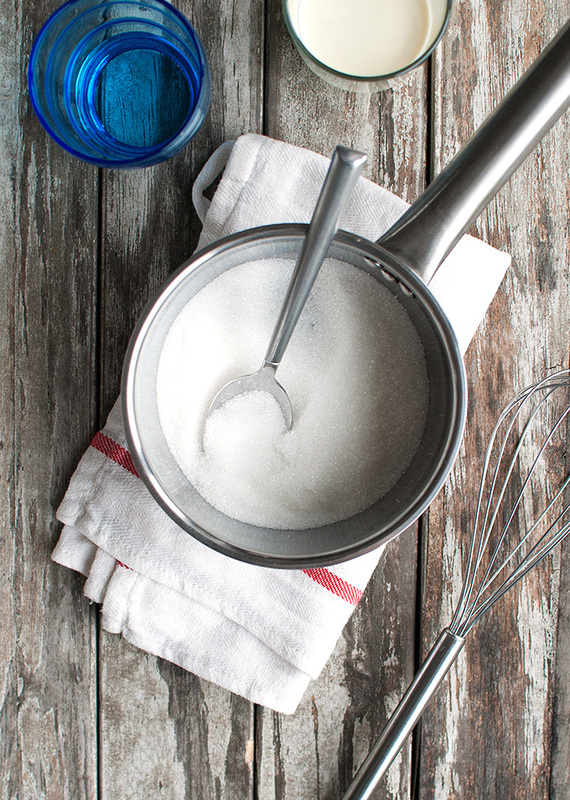 Add the sugar and the water to a medium-sized, light-colored saucepan. The light color of the saucepan makes it easy to monitor the color of the caramel as it cooks. Heat over low heat, stirring with a metal spoon until the sugar has dissolved. Crank up the heat to medium-high and cook to a golden caramel. Don't stir it at this point. The syrup will first start to caramelize at the edge of the pan. 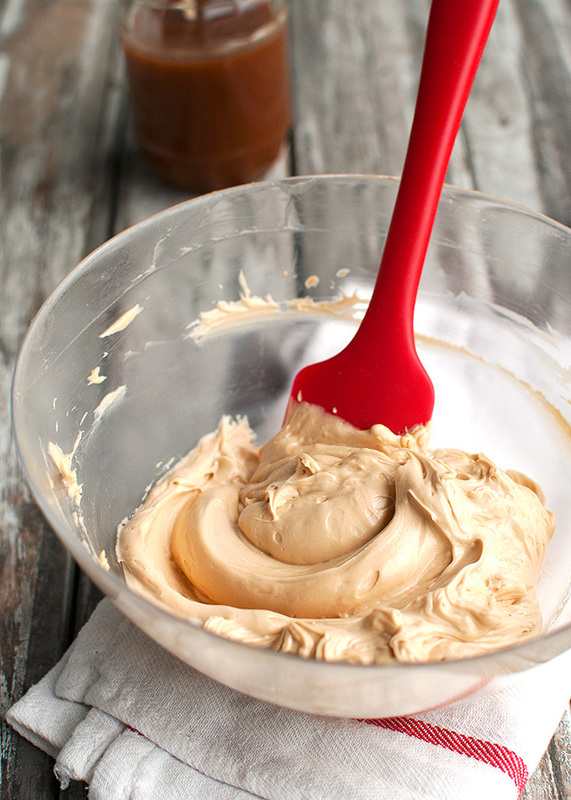 Once this happens, you can gently whisk the caramel to get an even color. Once you're happy with the color of the caramel, turn the heat down and carefully drizzle in the cream, whisking continuously. The caramel will bubble and sizzle, so be careful. Once all the cream has been added, turn the heat down, stop whisking and allow to cook for 1 minute. Then remove the pan from the heat and dunk the bottom of the pan into the water bath in the sink. There is no need to cool the caramel. You just need to stop the cooking process so the caramel won't become too dark. In a medium-sized bowl, whisk together the yolks, cornstarch and two tablespoons of the milk until the yolk mixture looks foamy and smooth. Add the rest of the milk and the salt to the caramel in the saucepan. Place the saucepan over low heat, whisking to dissolve the caramel into the milk Once the caramel has dissolved, crank the heat up to medium-high and scald the milk mixture. Once the first bubbles appear, remove the pan from the heat and carefully pour the hot milk mixture into the yolk mixture, whisking continuously to keep the eggs from scrambling. Once combined, pour the mixture back into the saucepan. Heat over low heat, whisking continuously, until the first bubbles appear and the mixture thickens considerably. Remove the pan from the heat and whisk for another minute to knock some of the heat out. Pour the caramel custard onto a clean plate and immediately cover it with plastic wrap, pressing the plastic wrap directly onto the custard. This keeps a skin from forming. Allow the custard to cool completely. Once the custard has cooled, beat the butter in a medium-sized bowl until smooth and fluffy and lightened in color, about 2 minutes. Add the cooled custard, one tablespoon at a time, mixing well after each addition. 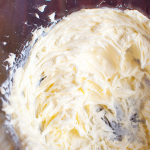 Once all the custard has been added, mix for another few minutes, until the buttercream looks thick, smooth and creamy. This buttercream is a bit softer than vanilla German buttercream, but it should pipe just as beautifully. 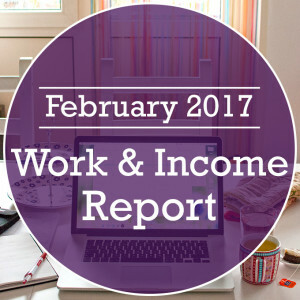 Use immediately or store in an airtight container or a zipper bag in the fridge for up to two weeks or in the freezer for up to two months. To use buttercream that has either been refrigerated or frozen, first allow to come to room temperature then beat until smooth and spreadable again. 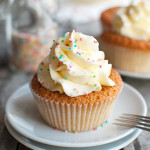 Cakes or cupcakes decorated with buttercream generally keep up to 3 days, stored in an airtight container in the fridge. Allow buttercream to come to room temperature before serving (for a big cake, this may take up to four hours!). Actually Nila, I was kind of fascinated to read about doing a headstand while pregnant to invert baby!! 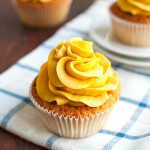 I clicked here today over from your vanilla cupcake post because I needed to know more about the scrumptious German caramel buttercream. Anything with caramel gets my full. attention. But then I got distracted by head stands. (My favourite asana in yoga!!). I know it’s many benefits but never heard of doing it for breech. Did it work? Obviously the wee one is doing great now!! Can’t wait to try caramel buttercream in my Passover macarons this year. Did you try the caramel buttercream yet? I also have a recipe for salted caramel macarons, with a salted caramel buttercream filling. I bet you like it!